Fighting continued in Misrata on Sunday morning despite claims of the Qaddafi regime that it was withdrawing its troops from the city, which seems to have been a bald-faced lie. In fact, Saturday saw unusually heavy fighting in the besieged city, with some 25 dead and 100 wounded. It is possible that the Qaddafi government is attempting to trick the Free Libya forces in the city into over-extending themselves, so that the Qaddafi loyalists can cut them off and destroy them. It is also possible that some uniformed troops are being replaced by tribal irregulars, as a way of confusing American drones The latter fly low and have cameras that can reveal details of targets down to their facial features. Regular Qaddafi brigades in uniforms who are indiscriminately shelling civilian areas would be sitting ducks for such drone strikes, but tribal levies in civvies might be able to confuse the drone operators. Some reports are saying that what Qaddafi has actually done is to give his regular troops an ultimatum that if they don’t soon take Misrata he will withdraw (and presumably punish them) and send in tribal levies instead. The danger to Qaddafi’s forces of the US drones was demonstrated on Saturday, when the first successful such strike took out a battery of rocket launchers that Tripoli’s troops had used to fire indiscriminately on the city. 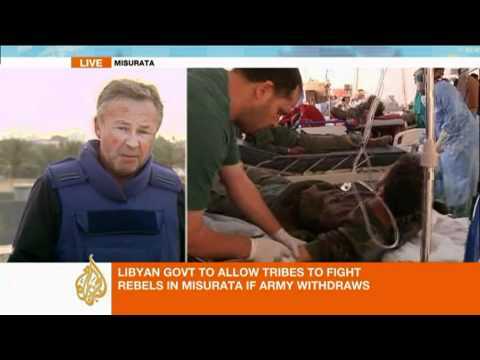 Aljazeera English has daring reporting from the scene that confirms that while the Free Libya forces have made advances against Qaddafi’s forces, the latter have by no means withdrawn from the city, and they still hold the hospital in the west that they have (quite illegally in international law) made their base. On Saturday, Qaddafi brigades occupied the center of the small town of Yafran in the Berber south, in the Western Mountains Region. The regime has been fiercely attacking Zintan and other towns in that area for week, but Yafran is the first to fall completely. Civilian populations have been blockaded during these attacks, and if the Free Libya forces had not taken a western checkpoint on the border with Tunisia, they say that people in Yafran had been in danger of starving. Also on Saturday, NATO airstrikes destroyed some 25 military vehicles of the Qaddafi army that were making their way toward Ajdabiya. Ajdabiya is a key petroleum center and also the gateway to the Free Libya positions in the east of the country.